I’m back once again to delve into the Mostly Average Kickstarter Kabinet to check out some of the coolest gaming projects currently being funded. Let’s start gaming! Now, Austen isn’t my bag (ex-girlfriends have essentially tainted her forever), but there’s a large contingent of fans across the globe. And to be fair, there isn’t enough fanfare and merchandise to go around. Sure, there are several versions of her stories across various mediums, but clearly there are not enough games set in Austenland. That’s where Elizabeth Bankhead’s The Jane Game comes in. Two to seven players enter the game as one of Austen’s heroines, where they can dictate how their life evolves. “…Becoming an accomplished woman, gaining life experience and choosing to marry or not” are among the game’s chief concerns. 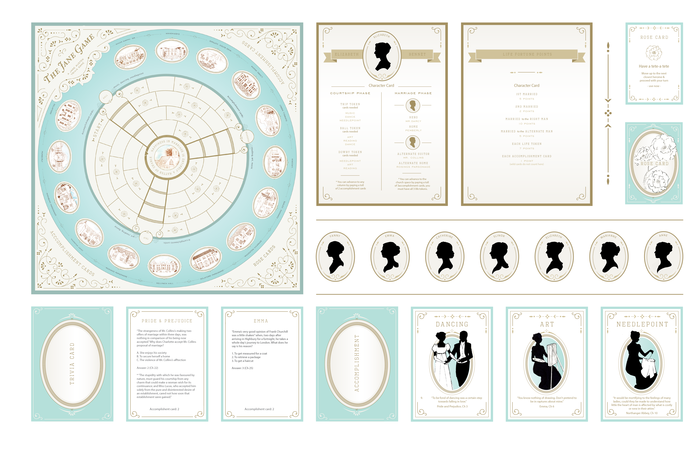 Elegantly (but sensibly) decorated Austen-trivia, life tokens, accomplishment cards, and game board are the game’s chief components. Elizabeth does her possible pledges a favor by explicitly spelling out the budget for the game’s creation, letting users see how much she’s truly putting into her baby. Were I such a fan, this would be a surefire purchase. But it’s also a great gift for a well-read lady in your life that doesn’t get to game enough. The components to The Jane Game. Price Points: $40 gets you a full physical edition of the game, a signed print (of one of Austen’s characters), and a PDF version of the game’s trivia questions. Higher price points extend the Austen-flavored fun further, with posters, a party package (with all the accouterments necessary to invite and wow your lady-friends), and an invite to a ball thrown by the Jane Austen Society of North America. But honestly, true Austen fans with a little disposable income should go for the “Col Brandon” pledge level. For $800, Elizabeth will come to your home with a party package and dresses for a night of gaming and idyllic conversation! Status: As of this moment the game is just over $10,000, short of it’s $18,000 funding goal. It’s funding period ends December 14th, so go check it out! It’s friggin’ cool because we clearly do not have enough “cooperative steampunk horror” board games in our lives. I mean, there’s NOTHING wrong with the description of Mage Company’s creation. 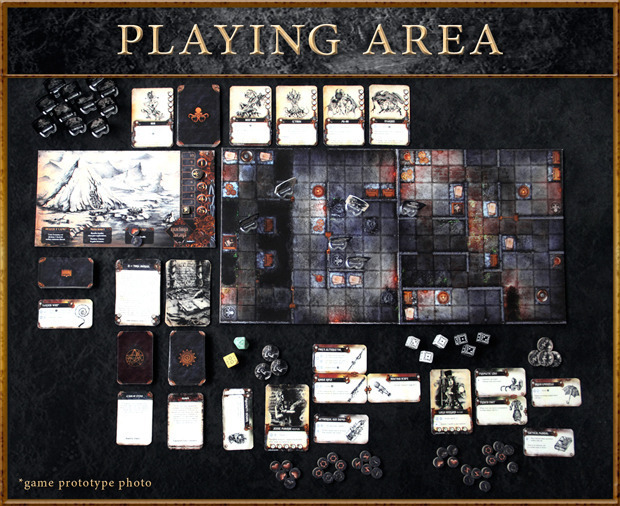 Machina Arcana‘s gameplay throws players into a hall of danger and horror as “explorers,” with monsters a’plenty in their way of escaping. Everyone starts with a weapon, but utilizing the environment’s traps or barriers will be key in ensuring the party’s ultimate survival. (But expect to be greeted with choices that will undoubtedly kill players so that the others may continue.) Machina Arcana‘s game designer and graphic designer have a helpful video so you can see what the actual gameplay is like. (And their accents are awesome.) More than anything else, this game has a very stylized aesthetic, one you don’t always see in other horror games. Price Points: $50 and up gets you the core game with all the unlocked content, which seems reasonable based on the quality of game pieces shown. The dice are gorgeous, the ten map tiles look extremely detailed and easily playable, and more content is on the way if stretch goals are reached. 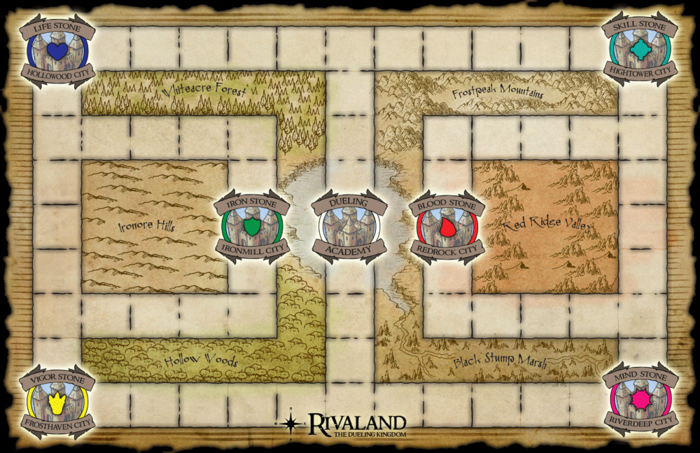 $75 nabs you the Kickstarter Exclusive box, which comes with an exclusive scenario, consisting of four chapters, eight events, and another map tile. Status: The game is already a bajillion percent funded, so it’s a GO. It ends on December 24th, so there’s plenty of time for you to decide if you want to invest the cash. Dungeon Duelers, by Medieval Man Studio, is a fast-paced combat game where up to four players command monsters in order to defeat their enemies. Objectives vary based on which version of the game you’re playing (collecting power stones or cycling through the game’s Story track and completing objectives) but the mechanics are the same throughout. The monster designs are inventive and fun, with “Owl Bears” (yes I said it, and it’s awesome), a Yeti, and a mysterious Wraith among the game’s 40 monsters. Easy and fun, the game would surely be a welcome addition to any gaming party’s rotation. Map for “The Beginning” box set. Price Points: $30 buys you one copy of one version of the game (“The Beginning” or “Champions Quest), while the $50 tier nets you both. A wealth of add-ons and even the assistance in creating some of the game’s content are among the higher tiered rewards. You can even be in the game! But every backer that pledges at least $20 will receive a “backer gift package” containing a Dueler t-shirt and a medallion. Status: As of right now, the game is 33% funded, with $3,000 pledged of its $10,000 goal. It needs some help, so give it a look-see before it ends on December 24th! Stretch goals will unlock more monsters and additional items and quest packs. And that’s it for this edition of the Kickstarter Kabinet! These games need love (and funding). Won’t you give it to them?